With SimCity‘s server/DRM problems mostly behind it, and users finally able to get in and play the game they purchased, this should be a relatively happy time for SimCity fans who have endured far too much over the game’s launch period. Sadly, it is starting to appear as if all those initial problems were just the calm before a much larger storm, as many users are starting to complain about poor Traffic AI and claiming that Electronic Arts may have lied about the theoretical Sim population sizes. A user on the EA forums has posted his findings after researching the “massive traffic-jams that seem to clog the entire system” in SimCity, and has come to the conclusion that the AI related to city services and traffic is basically broken. According to the forum user, the “agent system” that the game uses to spread power, water, and sewage appears to be almost identical to how traffic moves about cities. Just as “power agents” randomly move about and take a “ridiculously long time” to fill the map with power, Sims and traffic apparently operate in a similar, nonsensical, manor. After following the Sims around through their day, the user came to the following conclusion about how “workers” and all other Sim types operate. The “mindlessness” of the AI ends up causing huge traffic jams as the “herds” of Sims roam around looking to fill whatever the closest “slot” is to their position. This is compounded by the AI of police and fire department services, which apparently don’t cover zones but instead roam in packs (which are often stuck in traffic) and converge on the first crime/fire that happens, ignoring all other crimes/fires until the first emergency is over. Finally, the most damning allegation is that Electronic Arts may have lied about the maximum population sizes of the city when concerns were raised over the small tile sizes. 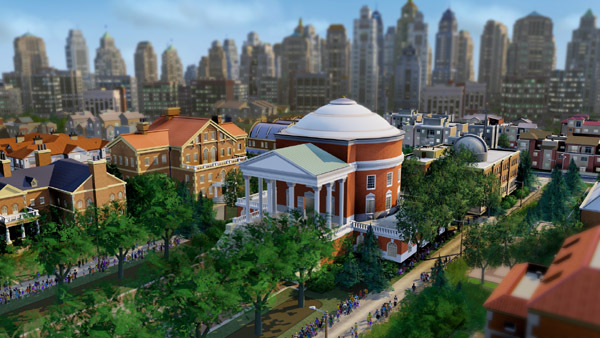 EA repeatedly stated that their internal testers had made cities with 500K and 1 million Sims, however, users are claiming that these high population cities are actually made up of hundreds of thousands of “phantom Sims” that add nothing to gameplay. The evidence for this claim comes from users who noticed that Low Income – High Density Housing will add a total of 600 residents, 400 workers, and 200 real shoppers, or a total of 1,200 Sims. However, if the building is destroyed, total population goes down by 5,200 (and it increases by 5,200 when the structure is rebuilt). The extra “phantom Sims” don’t appear to actually contribute anything, except to make SimCity cities appear to be larger than they actually are. None of this has been confirmed by EA, however, these are legitimate concerns that SimCity users are currently expressing in droves. After everything that occurred post launch, these latest complaints are the kind of thing that could end up turning fans away from the franchise. [Update] The complaints about SimCity’s apparent “phantom Sims” has been confirmed by a modder.